Creator: NATCO Natural Color Cards Co. 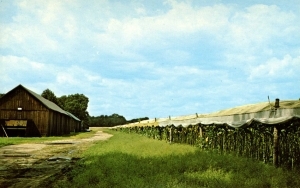 Description: Color postcard shows a typical Connecticut River Valley shade tobacco farm scene. Wooden tobacco sheds line one side of a dirt lane opposite an extensive field of nearly full grown shade tobacco plants under cloth netting.